Description CHIR-99021 (CT99021) is an inhibitor of GSK-3α/β with IC50 of 10 nM/6.7 nM; > 500-fold selectivity for GSK-3 versus its closest homologs CDC2 and ERK2, as well as other protein kinases. On day 0, differentiation was initiated with 8 μM CHIR-99021 for 24 h conferring canonical Wnt/β-catenin activation, followed by Wnt inhibition on day 3 by addition of 4 μM IWR-1 for 48 h. For all groups tested, first signs of eGFP-fluorescence and first beating EBs were observed on day 6 with a constant increase until d10, reaching almost 100% of beating EBs for the groups seeded with 666-2000 cells per aggregate. Flowcytometry analysis of dissociated EBs on day 10 showed the highest yield of 5.9 Nkx2-5-eGFP+ cells for the group seeded with 666 cells/aggregate; higher cell numbers per aggregate resulted in lower yields. 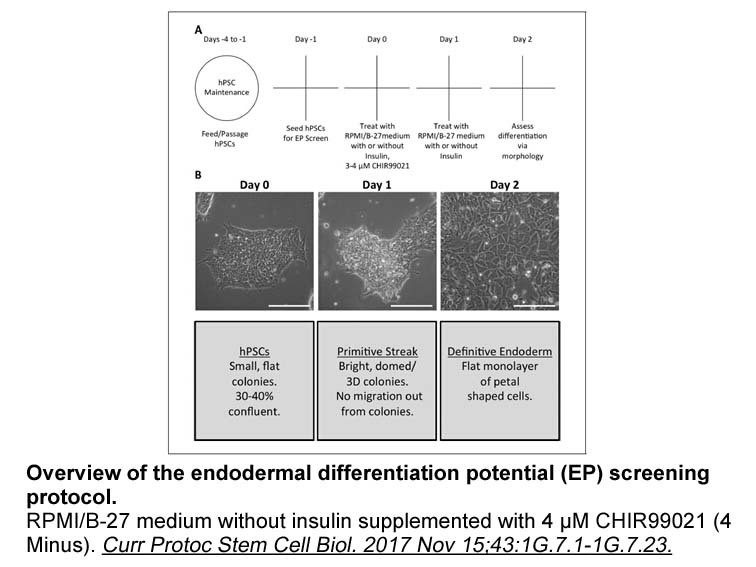 Immunofluorescence stainings of EB cryosections and dissociated/reseeded cells confirmed a high content of Nkx2-5+ and cTnT+ cardiomyocytes, thereby demonstrating efficient cardiomyogenic differentiation of human ESC-derived EBs after aggregation on agarose microwells and induction with small molecule-based media. At 15 min after the propranolol injection, the 2-min average HF fraction increased from 46.8 ± 2.9% before CHIR-99021 treatment to 67.8 ± 5.1% after CHIR-99021 treatment. 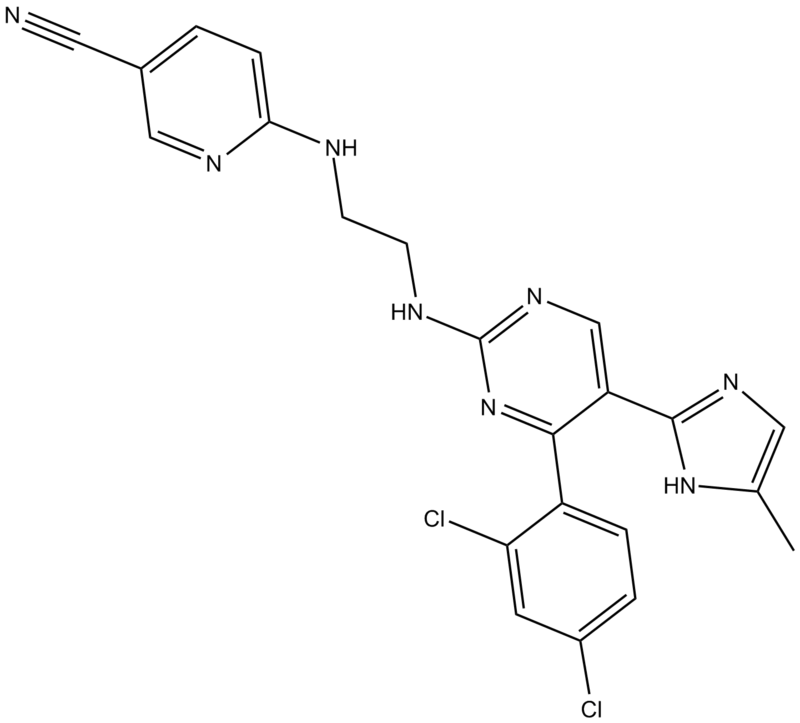 Treatment of Akita mice with CHIR-99021 increased SREBP-1 from 0.53 ± 0.07- to 1.17 ± 0.11- fold. CHIR-99021 treatment increased GIRK4 levels from 0.28 ± 0.06- to 1.08 ± 0.14- fold of those in WT mice, which was significantly higher than in placebo. 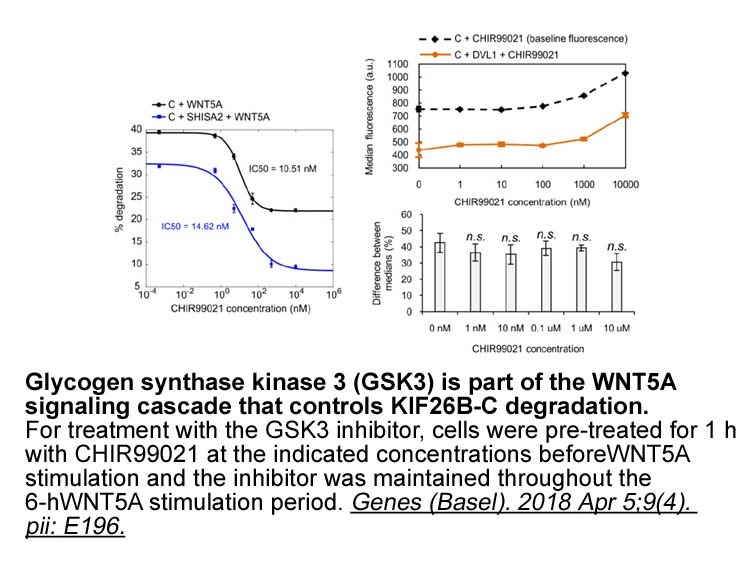 CHIR-99021 is a highly specific glycogen synthase kinase-3 (GSK-3) inhibitor which can inhibit both isoforms with IC50 of 10 nM (GSK-3α) and 6.7 nM (GSK-3β). CHIR-99021 was proved to promote self-renewal and maintain pluripotency of both B6 and BALB/c ES cells via stabilizing the downstream effectors like c-Myc and β -catenin. 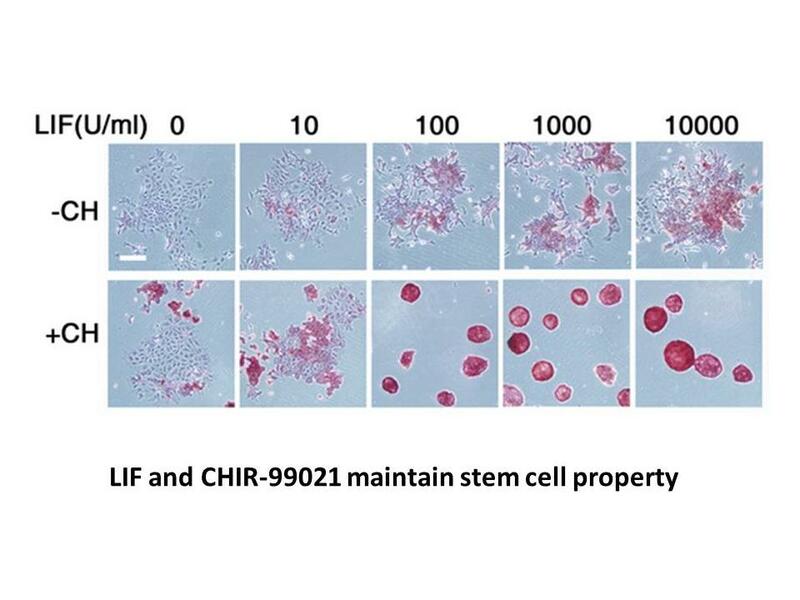 In J1 mESC cells, CHIR-99021 played an important role in maintaining the colony morphology as well as the self-renewal when combined with leukemia inhibitory factor (LIF). CHIR-99021 has shown to regulate multiple signaling pathways which involve Wnt/β-catenin, TGF-β, Nodal and MAPK, and the expression of epigenetic regulatory genes like Dnmt3l. 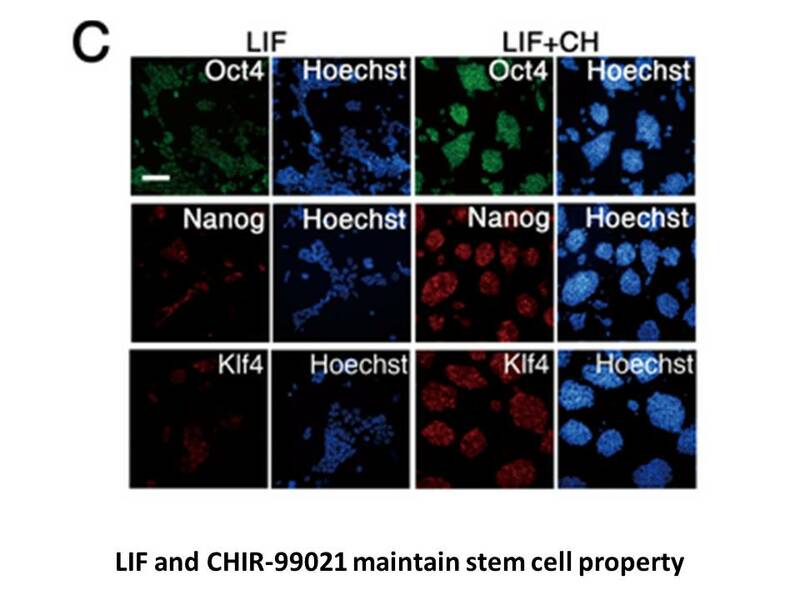 CHIR-99021 has been demonstrated to promote DN3 thymocytes proliferation and differentiation in the absence of pre-TCR signaling, Notch1 signaling or CXCL12. However, study has also found that higher concentration (10 ?M but not 1 ?M or 3 ?M) of CHIR99021 might selectively inhibit differentiation by activating IL-7 signaling pathway.